Arraying yourself with strength of mind, O glorious one, you counted the tortures of the godless as nothing, and you stood steadfast to the end. 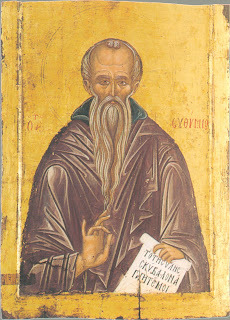 Being enlightened in mind through the divine Spirit, you reproached the most-lawless Akylinos, and proclaimed Christ as God with boldness, and kept His Orthodox Faith, and now in the heavens, you receive the prayers and doxologies that your servants offer ceaselessly to the Holy Trinity, and you intercede on behalf of those who honor your sacred memory with faith and fervor. Come, all those who love the martyrs, let us rejoice in the all-pure feast of the Champion, and let us feast spiritually. 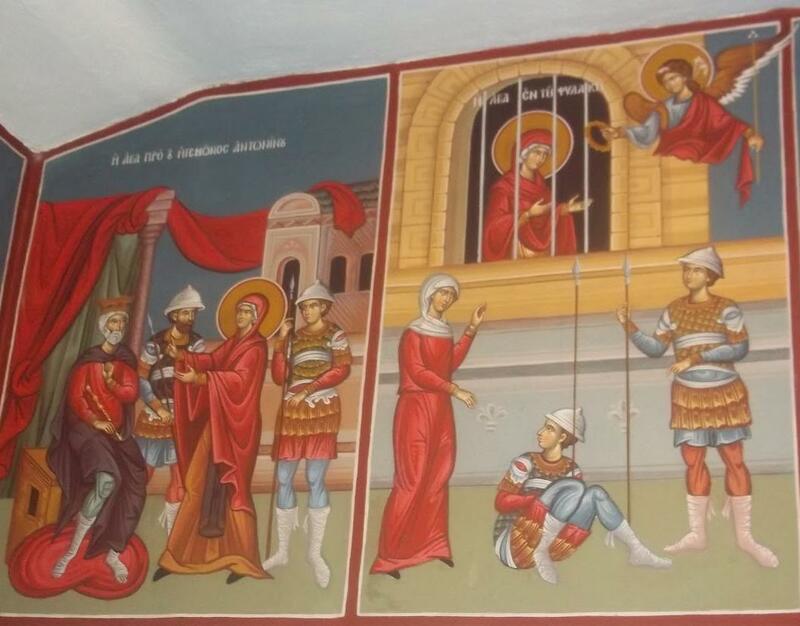 Today this honored festival of the Great Martyr Tryphon calls us to a table that is set by his struggles, and to the all-praised treasury of his relics, which pour forth healings as waves, to those who faithfully approach them, and from them flow healing of souls and bodies, and deliverance from dangers, and the great mercy. Today the honored feast of the Champion of Christ has dawned, enlightening the hearts of the faithful, and driving away the dark clouds of the demons. Through the grace and energy of the Spirit, let all who love martyrs cry out: Hail, you who were shown for the faithful to be a God-given and inexhaustible food. Hail, shield of the King, that has deposed the demons through the healing operation of the Spirit. Therefore, deliver us from our enemies from Hagar, those terrible tyrants, through your fervent and constant prayer to God Who loves man, O all-blessed Tryphon. As you now stand before Him, do not cease to intercede that we be delivered from dangers, and that we be granted the good things of life, for those who honor your all-sacred memory in faith. You endured the pains of torturers, having truly inherited the life without pain, O all-honored Tryphon, the foundation of Champions. Therefore, today the Church of Christ celebrates your all-holy memory, and rejoices in a godly manner. By the power of the Trinity you destroyed polytheism to the ends of the earth, and you were honored by Christ, all-glorious Tryphon; having conquered tyrants through Christ the Savior, you received your crown of martyrdom and the gift of divine healing, for you are invincible. A holy table is prepared today, all who love feasts, bringing the Pre-festal symbols, of the Lord forty-days old from His awesome birth from the Virgin, and He is held in the arms of the righteous Presbyter [Symeon], along with the memorial of the sacred Champion, for on behalf of him, Christ made him victorious, as the invincible. On the first of this month, the Memory of St. Tryphon the Great Martyr. What of you Tryphon? You have reached death by sword. Is this the time of your end? Not at all. On the first of February, Tryphon dies by beheading. 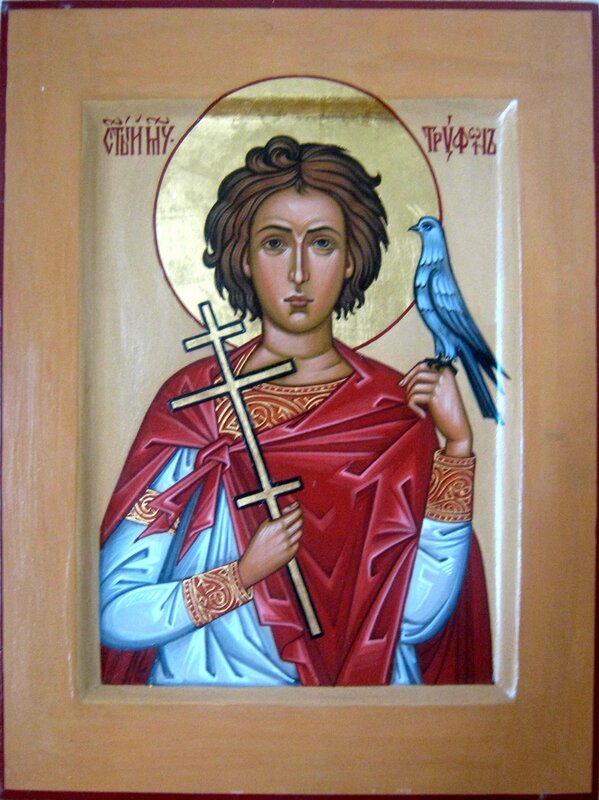 You truly showed to all, O all-famed Martyr Tryphon, that you were prudent with the height of humility, (and the demon flees meekness) and you heal every sickness and infirmity, as you raise to heaven without a ladder, imparting the immortal food that is your namesake. And the shepherd of geese has become an athlete of the heavenly mansions, as he now stands before the throne of Christ God. Do not cease to shepherd our lives, and ceaselessly entreat Him, that we be delivered from dangers, and from the godless tyrants that arm themselves against us, and bring down everyone's sword, for those who hymn in fervor your holy and all-honored memory. Let us the faithful praise Tryphon, the Great Martyr of Christ, that through his intercessions to the Lord, we be delivered from every evil. Let us therefore praise the perfect among martyrs, and offer words of joy to those who listen. The faithful skip, seeing the ways of Cyrus being praised, and the mass of the pious ones praise John, learning of his encomium. From the Gospels and from the words of the Lord, which were first offered to the apostles, comes the praise of the martyrs Cyrus and John, and we say to them: You are the light of the world, and the salt of the earth, O thrice-blessed ones, and the light to those in darkness and the salt that does not loose its potency, and the light that is not extinguished and the salt that is not thrown out, the sleepless light and the salt that is not trampled upon, the light that is ever seen and the salt that is ever effective, the light of everything sweet and the salt beloved by all things...the light of godly-knowledge and salt fashioned from love of God, light that dissolves the darkness and salt that gives flavoring to food, light that illumines the dark things and salt that makes pleasant unpleasant things, light that reveals things that were lost and salt which seasons things. O holy band, through whom the Divine works wonders! For truly “God is wondrous among His saints”. O band of martyrs, through whom the world rejoices! O band of righteous ones, through whom life is renewed! O band of holy ones, through whom the faith is preserved! O band of praised ones, through whom the faithful are magnified! O band of zealous ones, through whom error is destroyed! O band of powerful ones, through whom we are delivered from the devil! O band of soldiers, through whom the demons are banished to perdition! O band of pious ones, through whom the idols are drowned! Hail, O band truly holy, and presence of God, who confirm the age to come to men. Hail, O precious band, you who were heavenly without leaving the earth. Hail O holy band, you who rejoice with the angels and give help to men. You are truly worthy to hear from the Savior, Who praises and cries out with a great voice: “You are the light of the world and the salt of the earth,” light illuminating from the true light, and salt from that true spring of salt, and light that illumines those who take refuge in you, and spring that continuously flows for those who praise you. Please note that the meter of this translation is not set to match the original music. 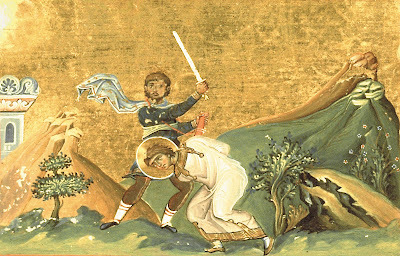 For the life of St. Paraskevi, see: http://full-of-grace-and-truth.blogspot.com/2009/07/st-paraskevi-great-martyr-of-rome.html. Rejoice, Paraskevi, O comely virgin. Rejoice, dear throne of God. Rejoice, pure servant of the Virgin. Rejoice, you who cease the tears and groans of mortals. Rejoice, for you rejoiced in the monastic path. Rejoice, you who were victorious through Christ’s power. Rejoice, speedy healer of wounds. Rejoice, our most beloved righteous one. Rejoice, heroism and worth of the calling. Rejoice, boast and seal of the angelic life. Rejoice, the ceasing of idol worship. 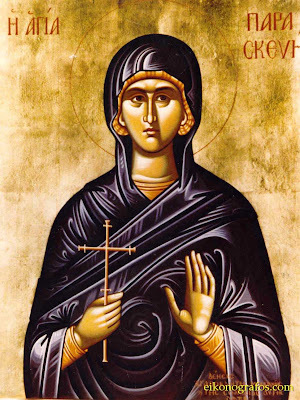 Rejoice, soul of godly monasticism. 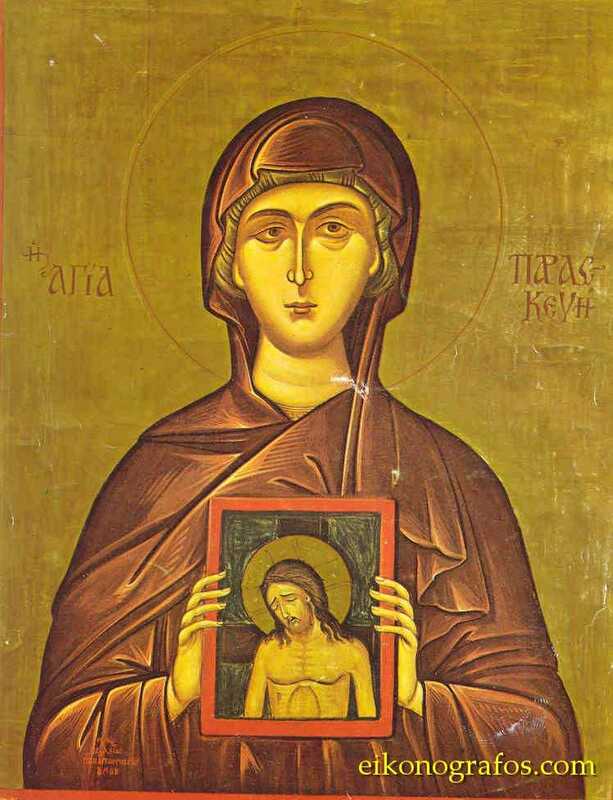 Rejoice, you who bestow grace on monastics. Rejoice, you who possess incorruptible treasuries in the Heavens. Rejoice, for you dissipate the cloud of error. Rejoice, lamp which shines with light of purity. Rejoice, rays of the supernatural life. Rejoice, harp of divine knowledge. Rejoice, you who spoke with the spotless Angels. Rejoice, protection and foundation of those who honor you with faith. Rejoice, you who were made worthy of the honor of the age to come. Rejoice, salve for our eyes. Rejoice, breath of unsleeping worship. Rejoice, for your fragrance was as pure nard (John 12:3). 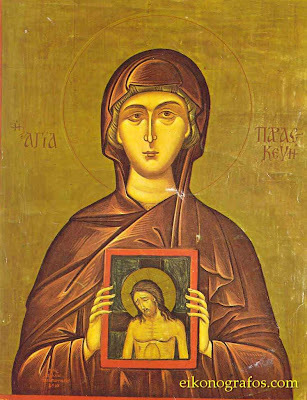 Rejoice, sweetest apostle of the Savior. Rejoice, for you imparted your experience to ascetics. Rejoice, for you are the protector of those endangered. Rejoice, disappearance of the false gods. Rejoice, reproach of the evil heart. Rejoice, our map and canon. Rejoice, you who shattered the faces of idols. Rejoice, all-fragrant rose, and seal of the soul. Rejoice, for you also trouble the swarms of the demons. Rejoice, chosen ode of the God of all. Rejoice, protector of every town and place. Rejoice, key of uncreated gifts. Rejoice, for you were steadfast manfully as you were being raked. 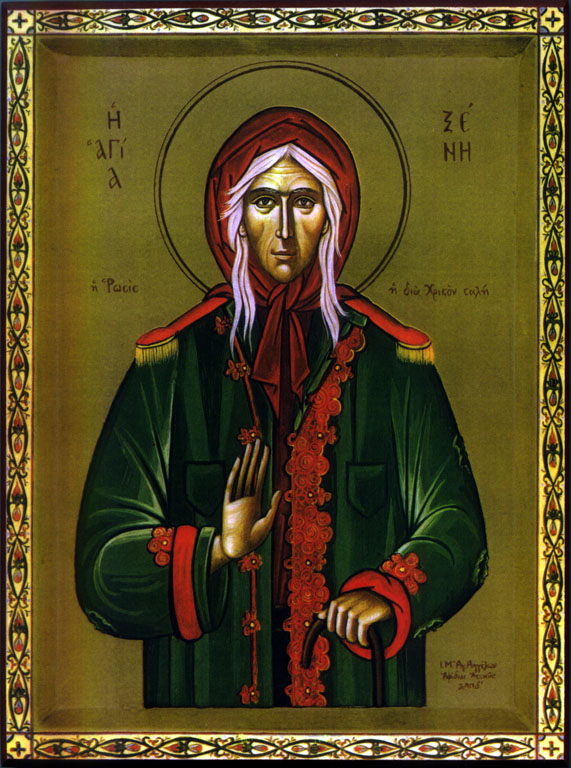 Rejoice, Martyr who also shelters desert ascetics. Rejoice,for you were divinely kept unharmed. Rejoice, you who grant light to the blind. Rejoice, through whom magic has disappeared. Rejoice, for you preached the Sun of love. Rejoice, purest eye that looks against the enemies. Rejoice, you who conquer the opposing swarms. Rejoice, soul arrayed in light. Rejoice, fragrance to men from Heaven. Rejoice, you who were victorious in beatings and asceticism. Rejoice, meekness of spirit, and giver of peace. Rejoice, for you are the intercessor to the Trinity. Rejoice, deliverer from sinister spirits. Rejoice, you through whom the governor was astounded. Rejoice, divine stream of wonders. Rejoice, plantress of rose-beds of monastics. Rejoice, dew of Hermon that burns up dangers. Rejoice, for your hand heals those in pain. 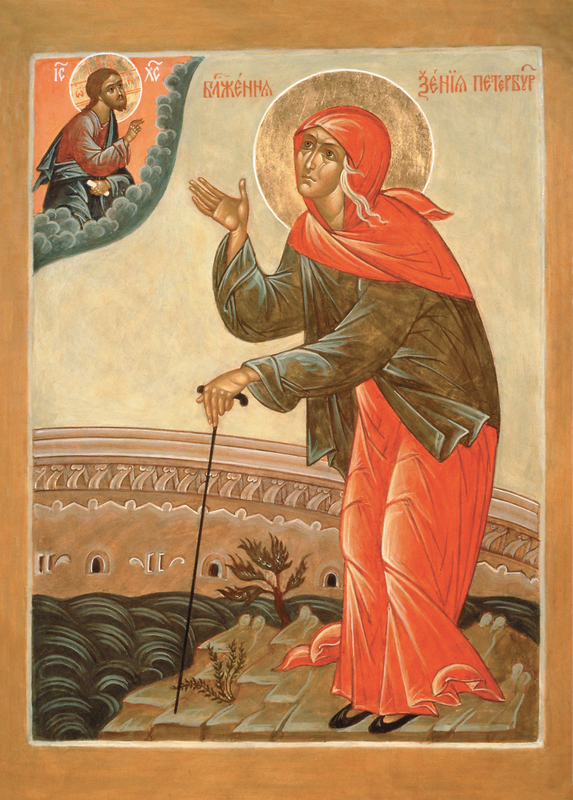 Rejoice, providence that you give to the poor. Rejoice, flower of joyous fragrance. Rejoice, trauma of the demons. Rejoice, guide of catechesis of the faithful. Rejoice, for you were hung from a peg by your hair. Rejoice, you who bore the weight from the evil doers. Rejoice,, all-wondrous one among apostles. Rejoice, firewood that accepted burnings. Rejoice, shield of those who bear your name. Rejoice,you who drove back the Germans. Rejoice, Martyr who makes the desires of the Bridal chamber disappear. Rejoice, for you deliver from the chaos of the faithless through your intercessions. Rejoice, terror to the demons. Rejoice, you who are the protection of those who hymn you. Saint Ephraim the Syrian, a teacher of repentance, was born at the beginning of the fourth century in the city of Nisibis (Mesopotamia) into the family of impoverished toilers of the soil. His parents raised their son in piety, but from his childhood he was known for his quick temper and impetuous character. He often had fights, acted thoughtlessly, and even doubted God's Providence. He finally recovered his senses by the grace of God, and embarked on the path of repentance and salvation. The young man ran off to the mountains to join the hermits. This form of Christian asceticism had been introduced by a disciple of St Anthony the Great, the Egyptian desert dweller Eugenius. 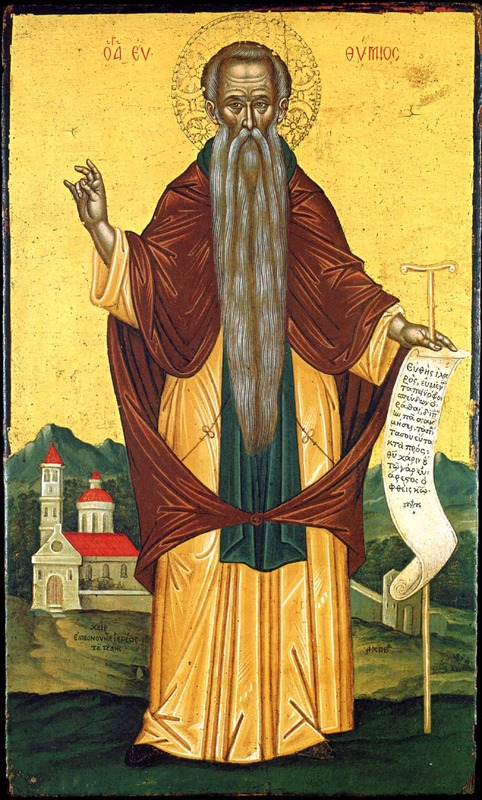 St James of Nisibis (January 13) was a noted ascetic, a preacher of Christianity and denouncer of the Arians. 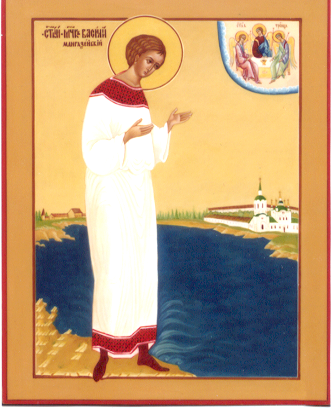 St Ephraim became one of his disciples. Under the direction of the holy hierarch, St Ephraim attained Christian meekness, humility, submission to God's will, and the strength to undergo various temptations without complaint. St James transformed the wayward youth into a humble and conrite monk. Realizing the great worth of his disciple, he made use of his talents. He trusted him to preach sermons, to instruct children in school, and he took Ephraim with him to the First Ecumenical Council at Nicea (in the year 325). St Ephraim was in obedience to St James for fourteen years, until the bishop's death in 338. 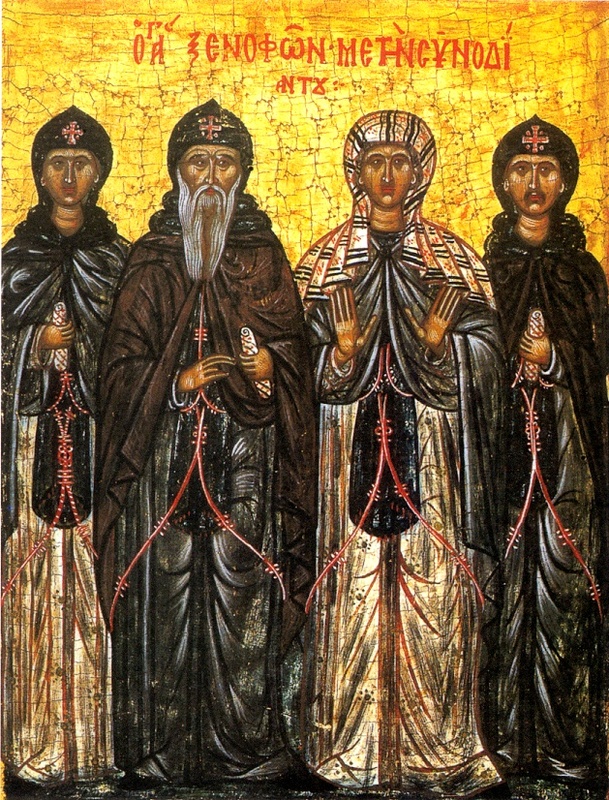 After the capture of Nisibis by the Persians in 363, St Ephraim went to a monastery near the city of Edessa. Here he saw many great ascetics, passing their lives in prayer and psalmody. Their caves were solitary shelters, and they fed themselves with a certain plant. He became especially close to the ascetic Julian (October 18), who was of one mind with him. St Ephraim combined asceticism with a ceaseless study of the Word of God, taking from it both solace and wisdom for his soul. The Lord gave him a gift of teaching, and people began to come to him, wanting to hear his counsel, which produced compunction in the soul, since he began with self-accusation. 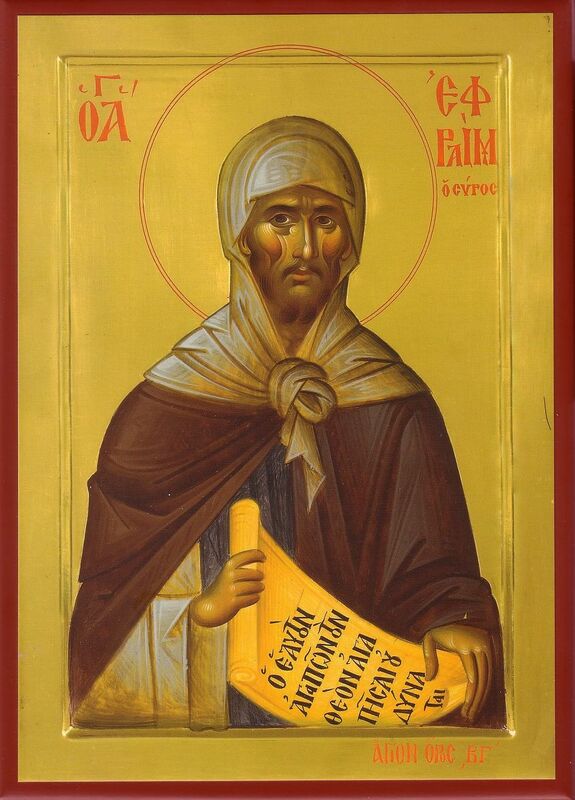 Both verbally and in writing, St Ephraim instructed everyone in repentance, faith and piety, and he denounced the Arian heresy, which at that time was causing great turmoil. Pagans who heard the preaching of the saint were converted to Christianity. 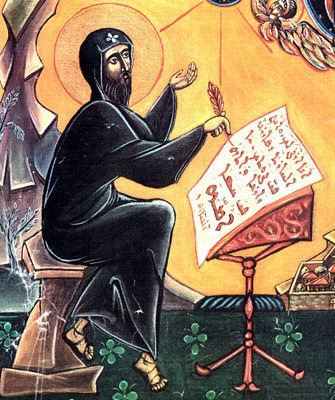 He also wrote the first Syriac commentary on the Pentateuch (i.e. "Five Books") of Moses. He wrote many prayers and hymns, thereby enriching the Church's liturgical services. 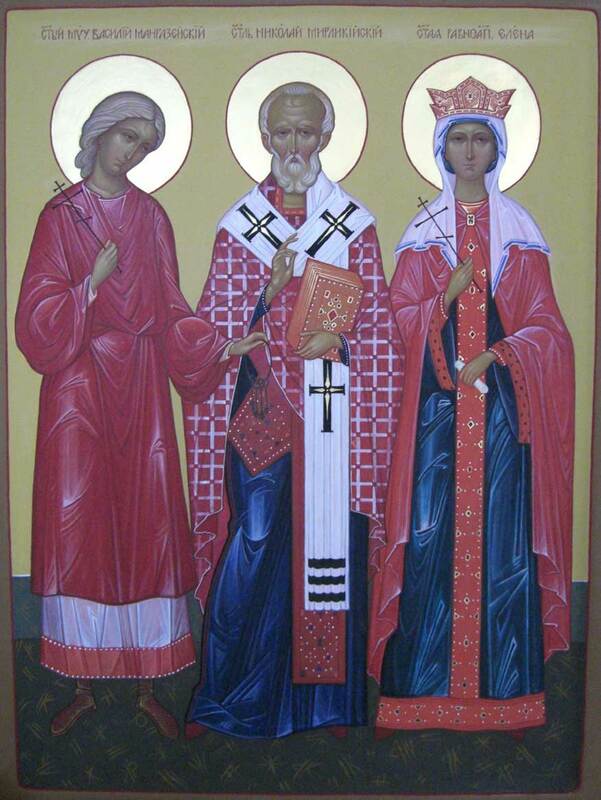 Famous prayers of St Ephraim are to the Most Holy Trinity, to the Son of God, and to the Most Holy Theotokos. He composed hymns for the Twelve Great Feasts of the Lord (the Nativity of Christ, the Baptism, the Resurrection), and funeral hymns. St Ephraim's Prayer of Repentance, "O Lord and Master of my life...", is recited during Great Lent, and it summons Christians to spiritual renewal. From ancient times the Church has valued the works of St Ephraim. His works were read publicly in certain churches after the Holy Scripture, as St Jerome tells us. At present, the Church Typikon prescribes certain of his instructions to be read on the days of Lent. 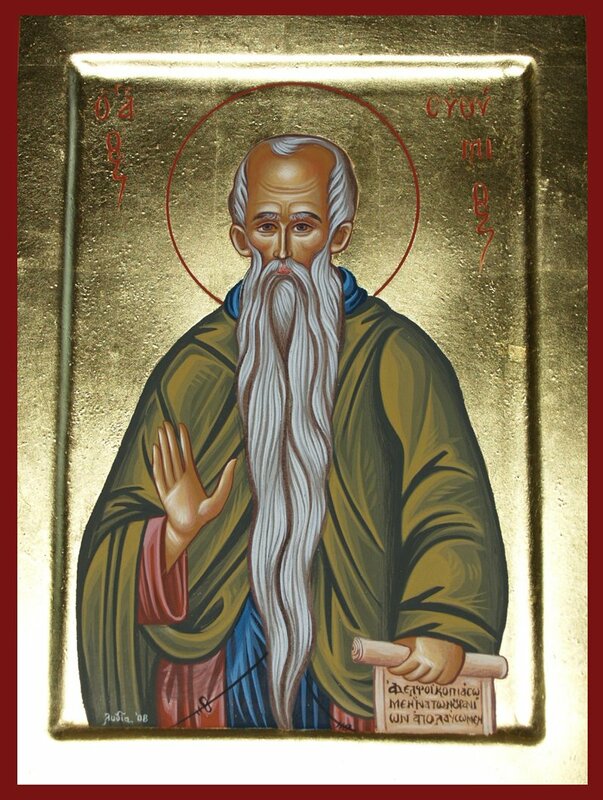 Among the prophets, St David is the preeminent psalmodist; among the Fathers of the Church, St Ephraim the Syrian is the preeminent man of prayer. His spiritual experience made him a guide for monastics and a help to the pastors of Edessa. 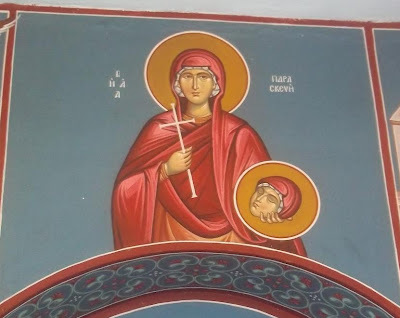 St Ephraim wrote in Syriac, but his works were very early translated into Greek and Armenian. Translations into Latin and Slavonic were made from the Greek text. 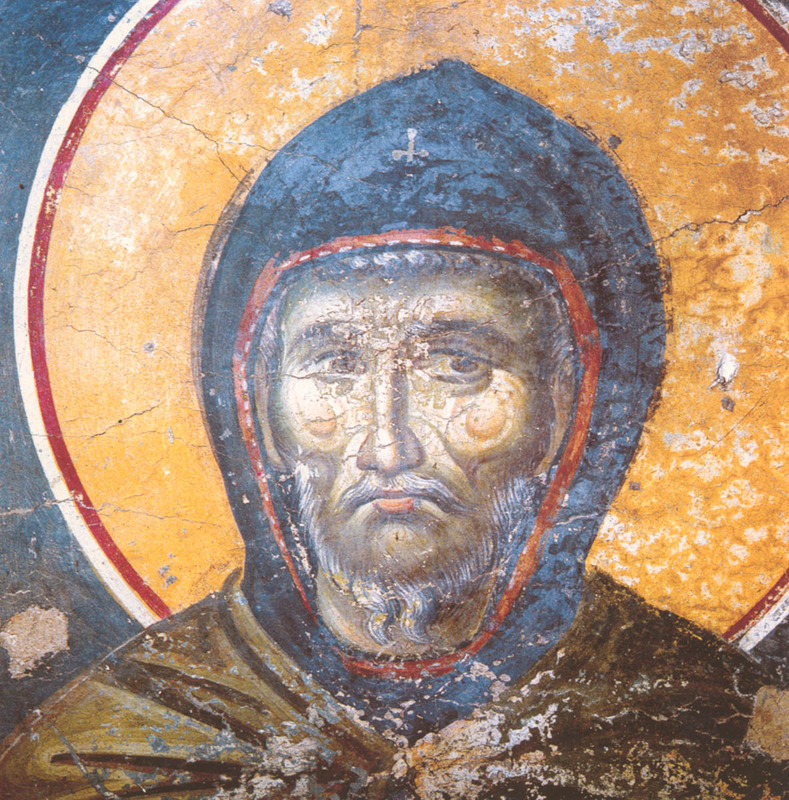 In many of St Ephraim's works we catch glimpses of the life of the Syrian ascetics, which was centered on prayer and working in various obediences for the common good of the brethren. The outlook of all the Syrian ascetics was the same. The monks believed that the goal of their efforts was communion with God and the acquisition of divine grace. For them, the present life was a time of tears, fasting and toil. "If the Son of God is within you, then His Kingdom is also within you. Thus, the Kingdom of God is within you, a sinner. Enter into yourself, search diligently and without toil you shall find it. Outside of you is death, and the door to it is sin. Enter into yourself, dwell within your heart, for God is there." Constant spiritual sobriety, the developing of good within man's soul gives him the possibility to take upon himself a task like blessedness, and a self-constraint like sanctity. The requital is presupposed in the earthly life of man, it is an undertaking of spiritual perfection by degrees. 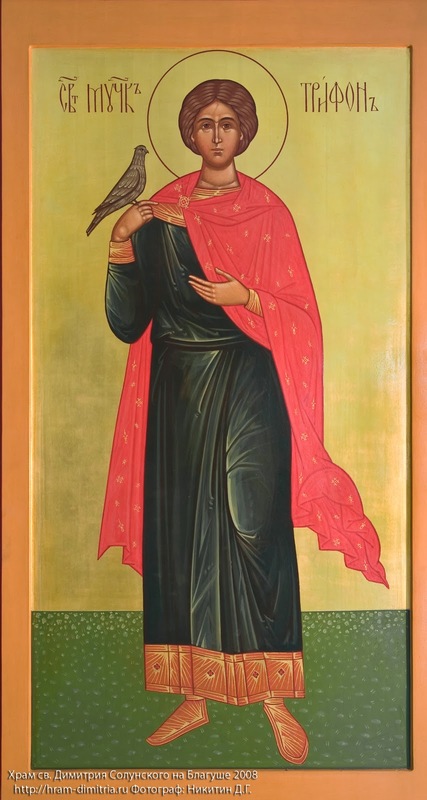 Whoever grows himself wings upon the earth, says St Ephraim, is one who soars up into the heights; whoever purifies his mind here below, there glimpses the Glory of God. In whatever measure each one loves God, he is, by God's love, satiated to fullness according to that measure. Man, cleansing himself and attaining the grace of the Holy Spirit while still here on earth, has a foretaste of the Kingdom of Heaven. To attain to life eternal, in the teachings of St Ephraim, does not mean to pass over from one realm of being into another, but rather to discover "the heavenly," spiritual condition of being. Eternal life is not bestown on man through God's one-sided efforts, but rather, it constantly grows like a seed within him by his efforts, toils and struggles. The pledge within us of "theosis" (or "deification") is the Baptism of Christ, and the main force that drives the Christian life is repentance. St Ephraim was a great teacher of repentance. The forgiveness of sins in the Mystery of Repentance, according to his teaching, is not an external exoneration, not a forgetting of the sins, but rather their complete undoing, their annihilation. The tears of repentance wash away and burn away the sin. Moreover, they (i.e. the tears) enliven, they transfigure sinful nature, they give the strength "to walk in the way of the the Lord's commandments," encouraging hope in God. In the fiery font of repentance, the saint wrote, "you sail yourself across, O sinner, you resurrect yourself from the dead." 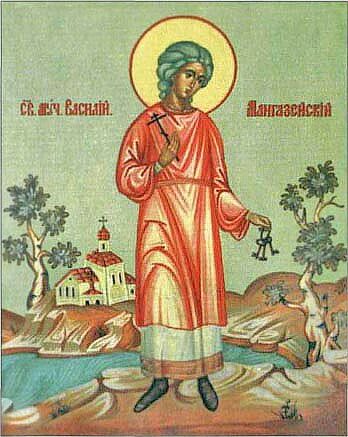 St Ephraim, accounting himself as the least and worst of all, went to Egypt at the end of his life to see the efforts of the great ascetics. He was accepted there as a welcome guest and received great solace from conversing with them. 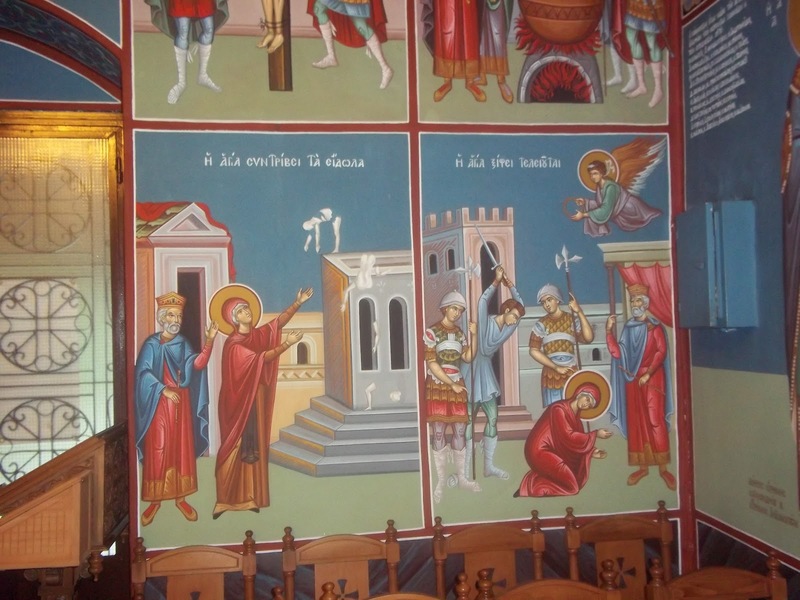 On his return journey he visited at Caesarea in Cappadocia with St Basil the Great (January 1), who wanted to ordain him a priest, but he considered himself unworthy of the priesthood. At the insistence of St Basil, he consented only to be ordained as a deacon, in which rank he remained until his death. 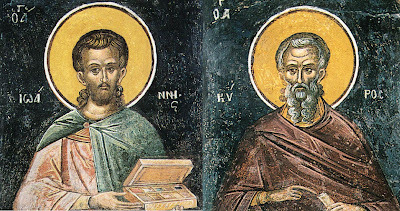 Later on, St Basil invited St Ephraim to accept a bishop's throne, but the saint feigned madness in order to avoid this honor, humbly regarding himself as unworthy of it. 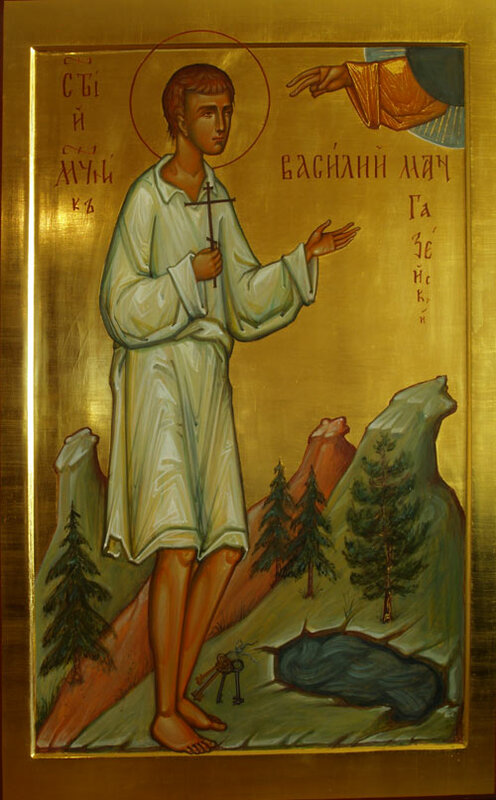 After his return to his own Edessa wilderness, St Ephraim hoped to spend the rest of his life in solitude, but divine Providence again summoned him to serve his neighbor. The inhabitants of Edessa were suffering from a devastating famine. By the influence of his word, the saint persuaded the wealthy to render aid to those in need. From the offerings of believers he built a poor-house for the poor and sick. St Ephraim then withdrew to a cave near Edessa, where he remained to the end of his days. By a flood of tears you made the desert fertile, and your longing for God brought forth fruits in abundance. By the radiance of miracles you illumined the whole universe! 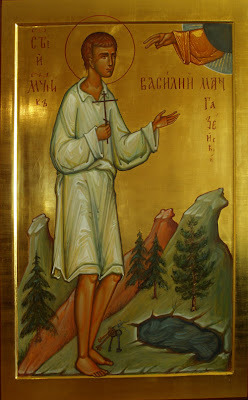 Our Father Ephraim, pray to Christ God to save our souls! Ever anticipating the hour of Judgment, you lamented bitterly, venerable Ephraim. Through your deeds you were a teacher by example; therefore, universal Father, you rouse the slothful to repentance. 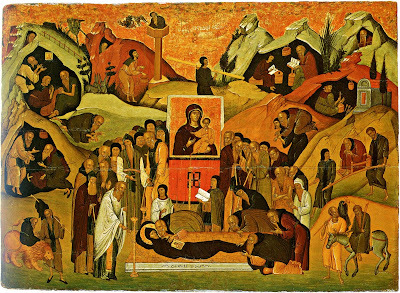 Bearing the life-giving stream in your soul, you were enriched with fear [of God], and were shown a treasury of compunction, therefore you lead us towards perfect virtues through the great number of your teachings. 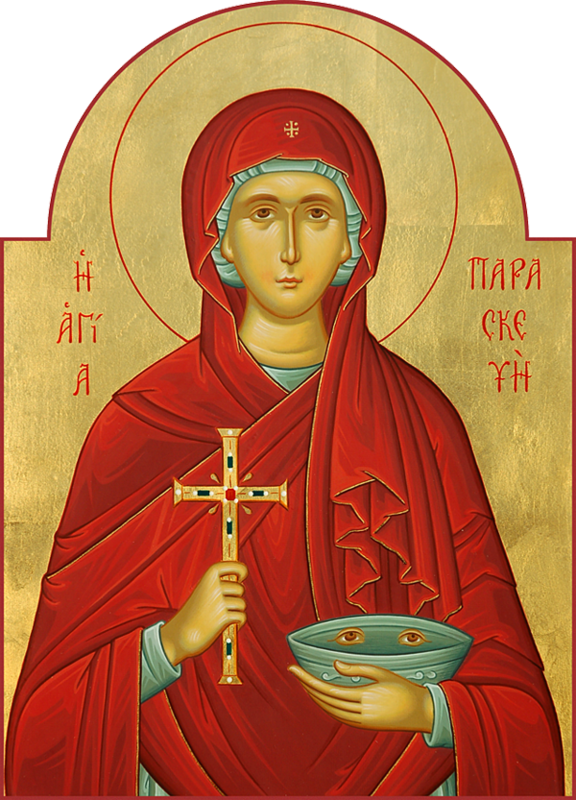 O Righteous Father Ephraim, entreat Christ God that we be granted the great mercy. Saint Xenophon, his wife Maria, and their sons Arcadius and John, were noted citizens of Constantinople and lived in the fifth century. Despite their riches and position, they distinguished themselves by their simplicity of soul and goodness of heart. Wishing to give their sons John and Arcadius a more complete education, they sent them off to the Phoenician city of Beirut. By divine Providence the ship on which both brothers sailed was wrecked. The waves tossed the brothers ashore at different places. Grieved at being separated, the brothers dedicated themselves to God and became monks. For a long time the parents had no news of their children and presumed them to be dead. 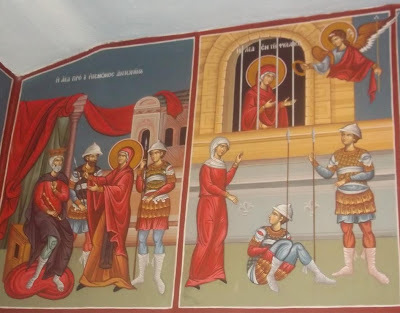 Xenophon, however, already quite old, maintained a firm hope in the Lord and consoled his wife Maria, telling her not to be sad, but to believe that the Lord watched over their children. After several years the couple made a pilgrimage to the holy places, and at Jerusalem they met their sons, living in asceticsm at different monasteries. The joyful parents gave thanks to the Lord for reuniting the family. 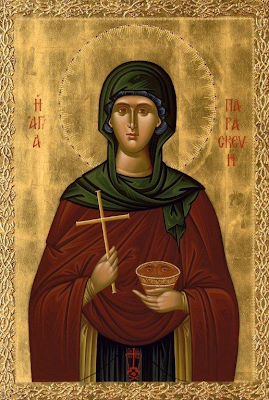 Sts Xenophon and Maria went to separate monasteries and dedicated themselves to God. 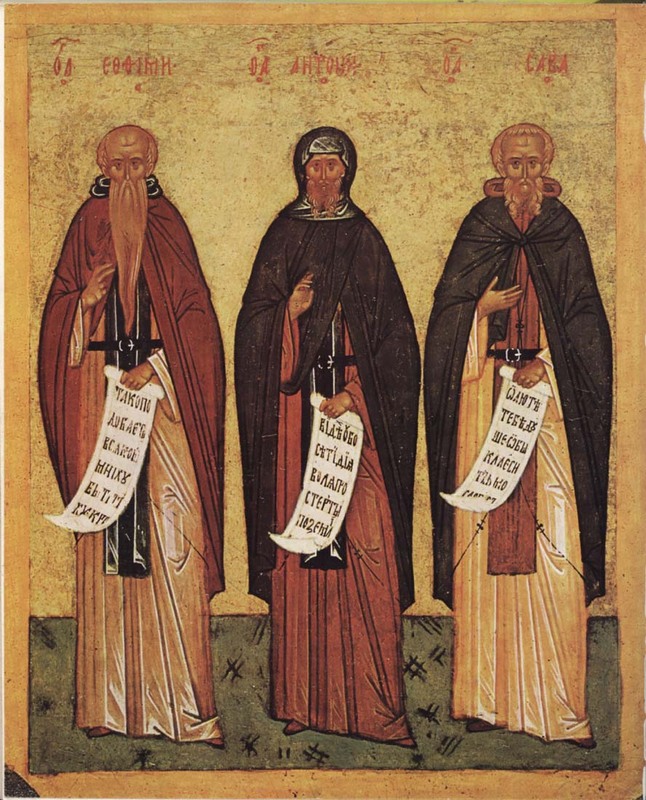 The monks Arcadius and John, having taken leave of their parents, went out into the wilderness, where after long ascetic toil they were glorified by gifts of wonderworking and discernment. 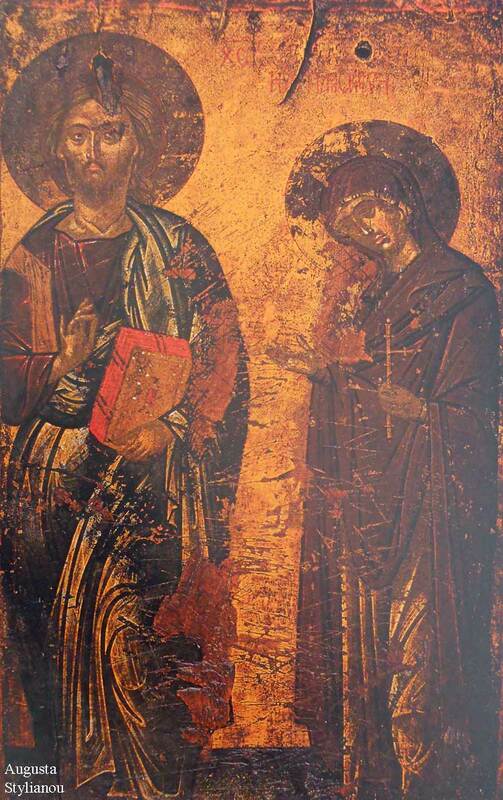 Sts Xenophon and Maria, laboring in silence and strict fasting, also received from God the gift of wonderworking. O God of our Fathers, always act with kindness towards us; take not Your mercy from us, but guide our lives in peace through the prayers of Venerable Xenophon and his family. You kept vigil in the courts of the Lord with your wife and two children, blessed Xenophon, and you gladly lavished your wealth on the poor. Therefore, you have inherited divine joy. As a generation blessed by the Lord, made worthy of heavenly glory, you glorified Christ upon the earth ascetically, the Righteous Xenophon, and his wife, along with their holy children, whom we praise, saying with joy: hail, O four-numbered band of the Righteous. 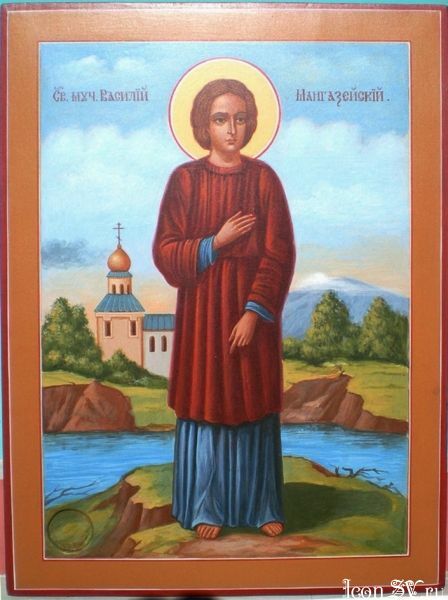 Saint Euthymius the Great came from the city of Melitene in Armenia, near the River Euphrates. 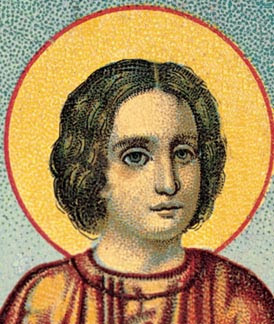 His parents, Paul and Dionysia, were pious Christians of noble birth. After many years of marriage they remained childless, and in their sorrow they entreated God to give them offspring. Finally, they had a vision and heard a voice saying, "Be of good cheer! God will grant you a son, who will bring joy to the churches." The child was named Euthymius ("good cheer"). 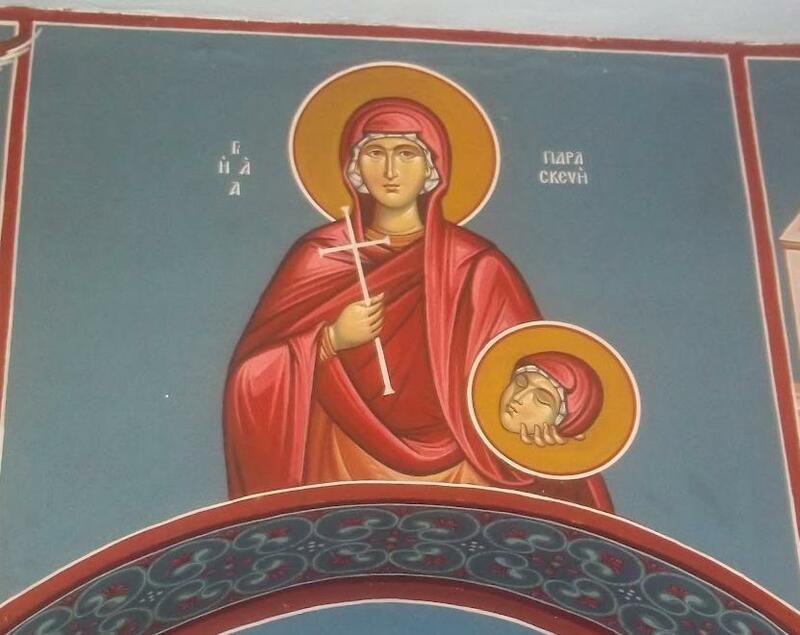 St Euthymius' father died soon after this, and his mother, fulfilling her vow to dedicate her son to God, gave him to her brother, the priest Eudoxius, to be educated. He presented the chid to Bishop Eutroius of Melitene, who accepted him with love. Seeing his good conduct, the bishop soon made him a Reader. St Euthymius later became a monk and was ordained to the holy priesthood. At the same time, he was entrusted with the supervision of all the city monasteries. St Euthymius often visited the monastery of St Polyeuctus, and during Great Lent he withdrew into the wilderness. His responsibility for the monasteries weighed heavily upon the ascetic, and conflicted with his desire for stillness, so he secretly left the city and headed to Jerusalem. After venerating the holy shrines, he visited the Fathers in the desert. Since there was a solitary cell in the Tharan lavra, he settled into it, earning his living by weaving baskets. Nearby, his neighbor St Theoctistus (September 3) also lived in asceticism. They shared the same zeal for God and for spiritual struggles, and each strove to attain what the other desired. They had such love for one another that they seemed to share one soul and one will. People seeking spiritual benefit began to visit the hermits and brought them food. Gradually, a monastic community grew up around them. Several monks came from the Tharan monastery, among them Marinus and Luke. 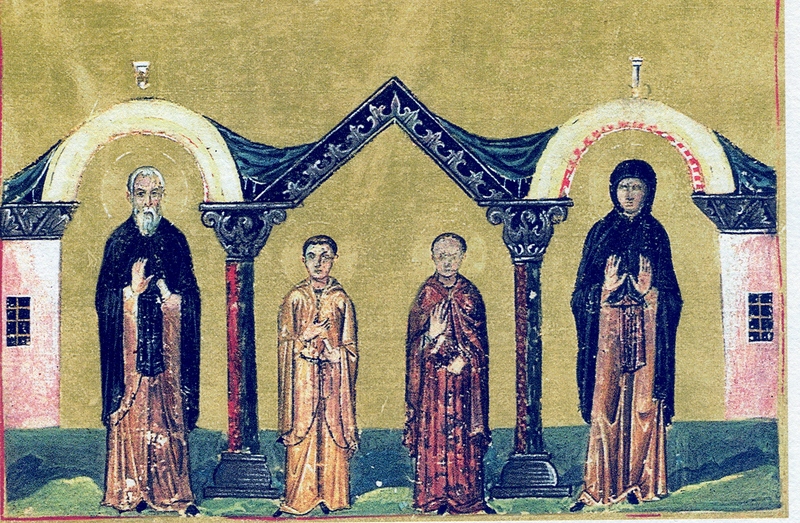 St Euthymius entrusted the supervision of the growing monastery to his friend Theoctistus. St Euthymius exhorted the brethren to guard their thoughts. 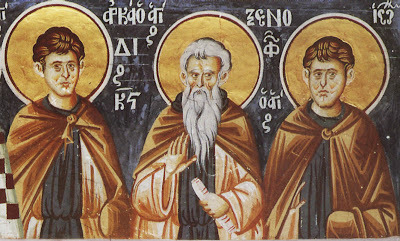 "Whoever desires to lead the monastic life should not follow his own will. He should be obedient and humble, and be mindful of the hour of death. He should fear the judgment and eternal fire, and seek the heavenly Kingdom." The saint taught young monks to fix their thoughts on God while engaging in physical labor. "If laymen work in order to feed themselves and their families, and to give alms and offer sacrifice to God, then are not we as monks obliged to work to sustain ourselves and to avoid idleness? We should not depend on strangers." 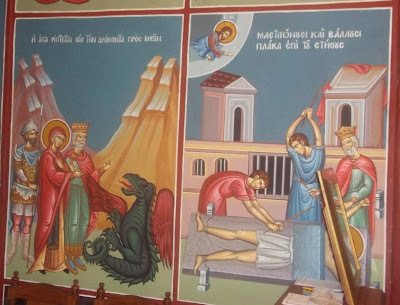 In these years St Euthymius converted and baptized many Arabs. Among them were the Saracen leaders Aspebet and his son Terebon, both of whom St Euthymius healed of sickness. Aspebet received the name Peter in Baptism and afterwards he was a bishop among the Arabs. Word of the miracles performed by St Euthymius spread quickly. People came from everywhere to be healed of their ailments, and he cured them. Unable to bear human fame and glory, the monk secretly left the monastery, taking only his closest disciple Dometian with him. He withdrew into the Rouba desert and settled on Mt. Marda, near the Dead Sea. In his quest for solitude, the saint explored the wilderness of Ziph and settled in the cave where David once hid from King Saul. 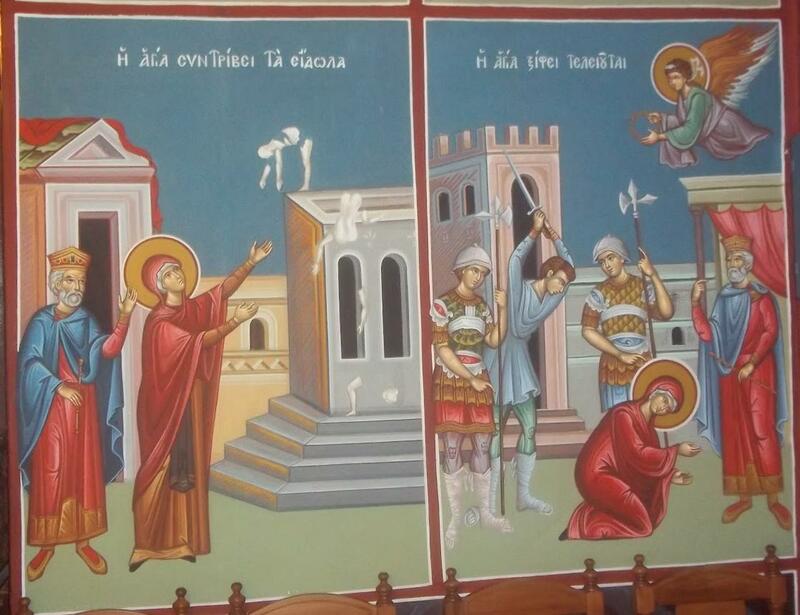 St Euthymius founded a monastery beside David's cave, and built a church. During this time St Euthymius converted many monks from the Manichean heresy, he also healed the sick and cast out devils. Visitors disturbed the tranquillity of the wilderness. Since he loved silence, the saint decided to return to the monastery of St Theoctistus. Along the way they found a quiet level place on a hill, and he remained there. This would become the site of St Euthymius' lavra, and a little cave served as his cell, and then as his grave. St Theoctistus went with his brethren to St Euthymius and requested him to return to the monastery, but the monk did not agree to this. However, he did promise to attend Sunday services at the monastery. 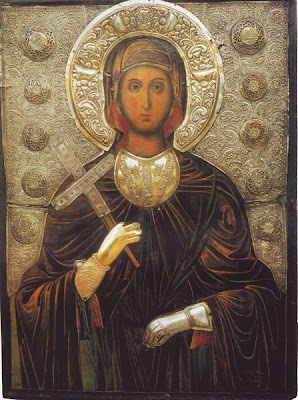 St Euthymius did not wish to have anyone nearby, nor to organize a cenobium or a lavra. The Lord commanded him in a vision not to drive away those who came to him for the salvation of their souls. After some time brethren again gathered around him, and he organized a lavra, on the pattern of the Tharan Lavra. 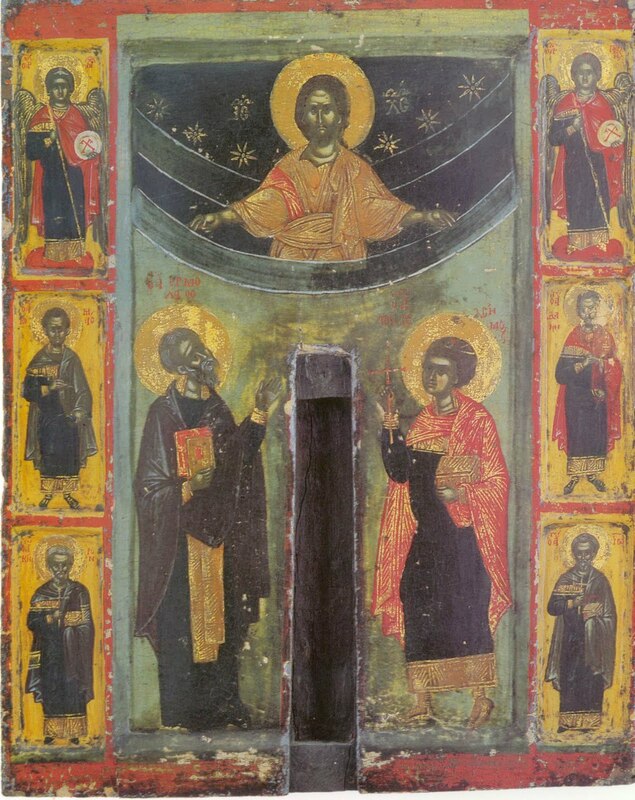 In the year 429, when St Euthymius was fifty-two years old, Patriarch Juvenal of Jerusalem consecrated the lavra church and supplied it with presbyters and deacons. The lavra was poor at first, but the saint believed that God would provide for His servants. Once, about 400 Armenians on their way to the Jordan came to the lavra. 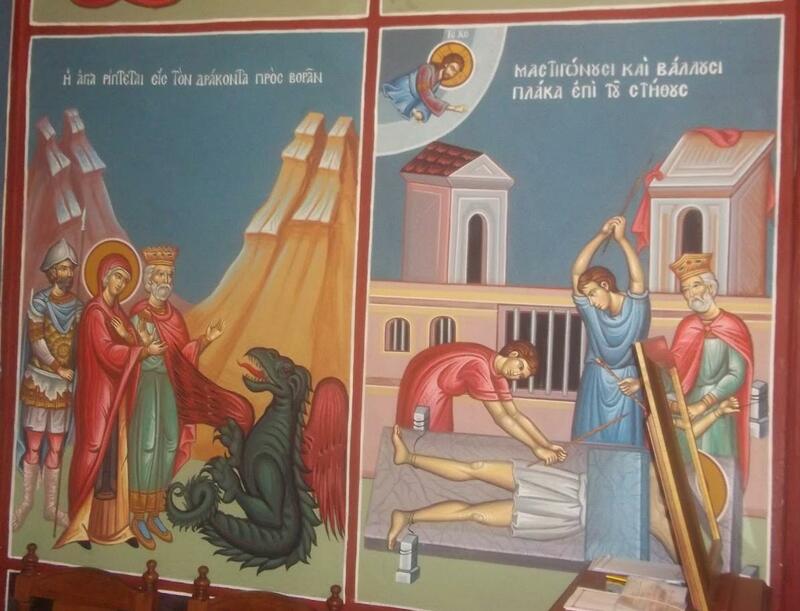 Seeing this, St Euthymius called the steward and ordered him to feed the pilgrims. The steward said that there was not enough food in the monastery. 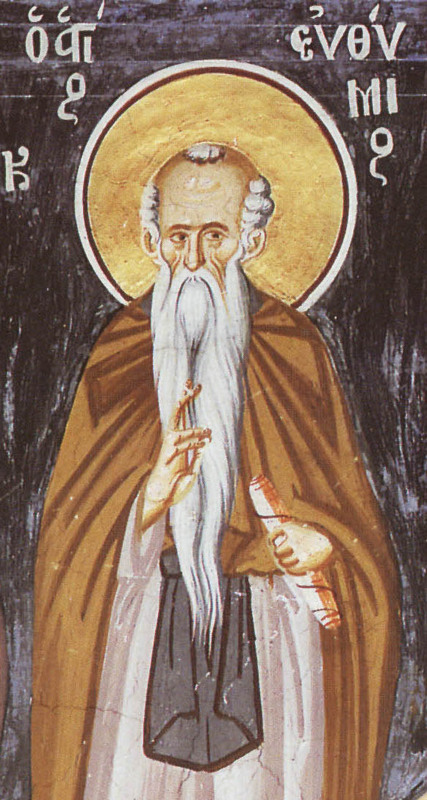 St Euthymius, however, insisted. Going to the storeroom where the bread was kept, the steward found a large quantity of bread, and the wine casks and oil jars were also filled. The pilgrims ate their fill, and for three months afterwards the door of the storeroom could not be shut because of the abundace of bread. The food remained undiminished, just like the widow of Zarephath's barrel of meal and cruse of oil (1/3 Kings 17:8-16). Once, the monk Auxentius refused to carry out his assigned obedience. Despite the fact that St Euthymius summoned him and urged him to comply, he remained obstinate. The saint then shouted loudly, "You will be rewarded for your insubordination." A demon seized Auxentius and threw him to the ground. The brethren asked Abba Euthymius to help him, and then the saint healed the unfortunate one, who came to himself, asked forgiveness and promised to correct himself. "Obedience," said St Euthymius, "is a great virtue. The Lord loves obedience more than sacrifice, but disobedience leads to death." 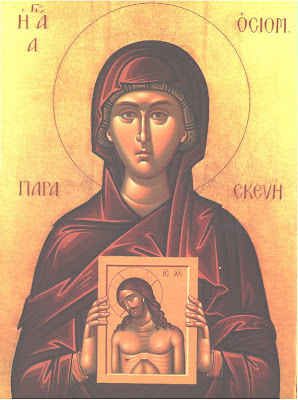 Two of the brethren became overwhelmed by the austere life in the monastery of St Euthymius, and they resolved to flee. St Euthymius saw in a vision that they would be ensnared by the devil. He summoned them and admonished them to abandon their destructive intention. He said, "We must never admit evil thoughts that fill us with sorrow and hatred for the place in which we live, and suggest that we go somewhere else. If someone tries to do something good in the place where he lives but fails to complete it, he should not think that he will accomplish it elsewhere. It is not the place that produces success, but faith and a firm will. A tree which is often transplanted does not bear fruit." In the year 431, the Third Ecumenical Council was convened in Ephesus to combat the Nestorian heresy. 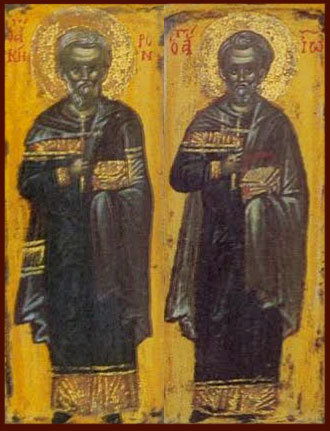 St Euthymius rejoiced over the affirmation of Orthodoxy, but was grieved about Archbishop John of Antioch who defended Nestorius. In the year 451 the Fourth Ecumenical Council met in Chalcedon to condemn the heresy of Dioscorus who, in contrast to Nestorius, asserted that in the Lord Jesus Christ there is only one nature, the divine (thus the heresy was called Monophysite). He taught that in the Incarnation, Christ's human nature is swallowed up by the divine nature. St Euthymius accepted the decisions of the Council of Chalcedon and he acknowledged it as Orthodox. News of this spread quickly among the monks and hermits. Many of them, who had previously believed wrongly, accepted the decisions of the Council of Chalcedon because of the example of St Euthymius. 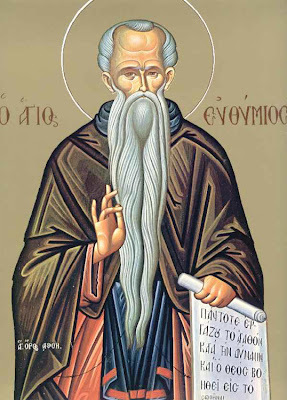 Because of his ascetic life and firm confession of the Orthodox Faith, St Euthymius is called "the Great." Wearied by contact with the world, the holy abba went for a time into the inner desert. 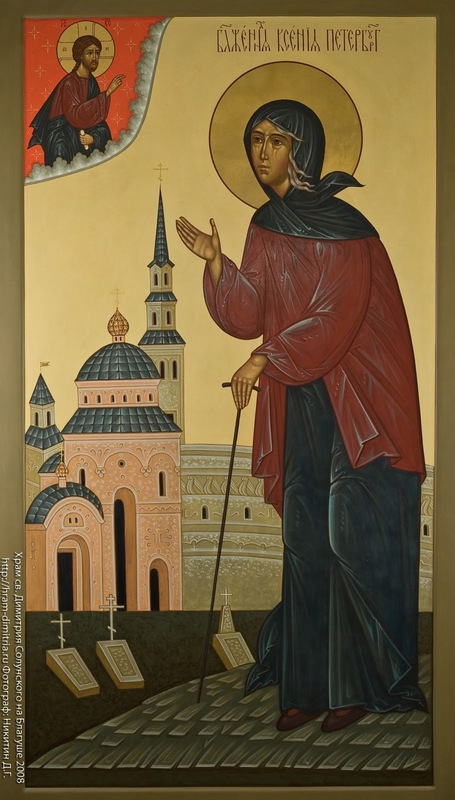 After his return to the lavra some of the brethren saw that when he celebrated the Divine Liturgy, fire descended from Heaven and encircled the saint. St Euthymius himself revealed to several of the monks that often he saw an angel celebrating the Holy Liturgy with him. The saint had the gift of clairvoyance, and he could discern a person's thoughts and spiritual state from his outward appearance. When the monks received the Holy Mysteries, the saint knew who approached worthily, and who received unworthily. 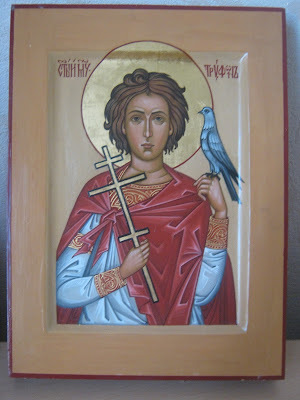 When St Euthymius was 82 years old, the young Sava (the future St Sava the Sanctified, December 5), came to his lavra. The Elder received him with love and sent him to the monastery of St Theoctistus. 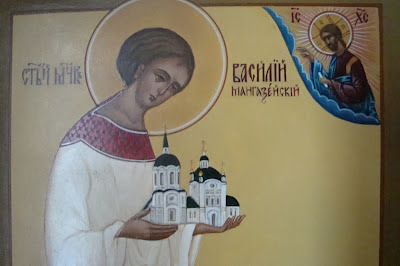 He foretold that St Sava would outshine all his other disciples in virtue. When the saint was ninety years of age, his companion and fellow monk Theoctistus became grievously ill. St Euthymius went to visit his friend and remained at the monastery for several days. He took leave of him and was present at his end. After burying his body in a grave, he returned to the lavra. 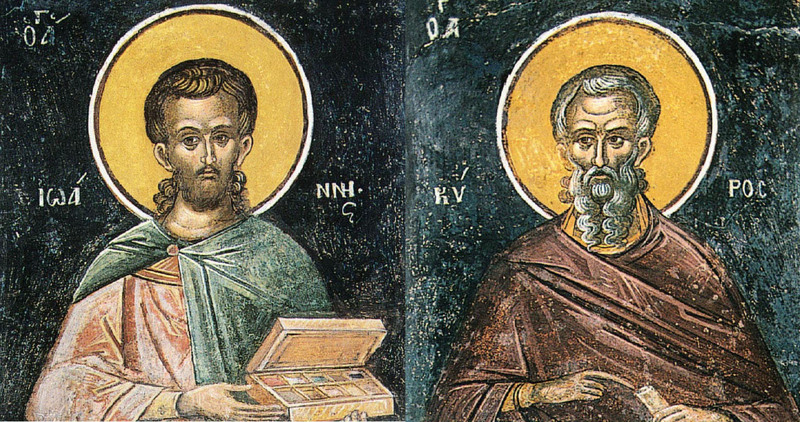 God revealed to St Euthymius the time of his death. On the eve of the Feast of St Anthony the Great (January 17) St Euthymius gave the blessing to serve the all-night Vigil. When the service ended, he took the priests aside and told them that he would never serve another Vigil with them, because the Lord was calling him from this earthly life. All were filled with great sadness, but the saint asked the brethren to meet him in church in the morning. He began to instruct them, "If you love me, keep my commandments (John 14:15). Love is the highest virtue, and the bond of perfectness (Col. 3:14). Every virtue is made secure by love and humility. The Lord humbled Himself because of His Love for us and became man. Therefore, we ought to praise Him unceasingly, especially since we monks have escaped worldly distractions and concerns." "Look to yourselves, and preserve your souls and bodies in purity. Do not fail to attend the church services, and keep the traditions and rules of our community. If one of the brethren struggles with unclean thoughts, correct, console, and instruct him, so that he does not fall into the devil's snares. Never refuse hospitality to visitors. Offer a bed to every stranger. Give whatever you can to help the poor in their misfortune." Afterwards, having given instructions for the guidance of the brethren, the saint promised always to remain in spirit with them and with those who followed them in his monastery.St Euthymius then dismissed everyone but his disciple Dometian. He remained in the altar for three days, then died on January 20, 473 at the age of ninety-seven. A multitude of monks from all the monasteries and from the desert came to the lavra for the holy abba's burial, among whom was St Gerasimus. 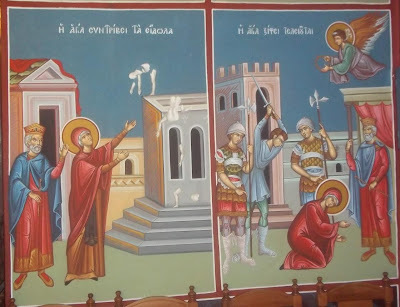 The Patriarch Anastasius also came with his clergy, as well as the Nitrian monks Martyrius and Elias, who later became Patriarchs of Jerusalem, as St Euthymius had foretold. Dometian remained by the grave of his Elder for six days. On the seventh day, he saw the holy abba in glory, beckoning to his disciple. "Come, my child, the Lord Jesus Christ wants you to be with me." After telling the brethren about the vision, Dometian went to church and joyfully surrendered his soul to God. 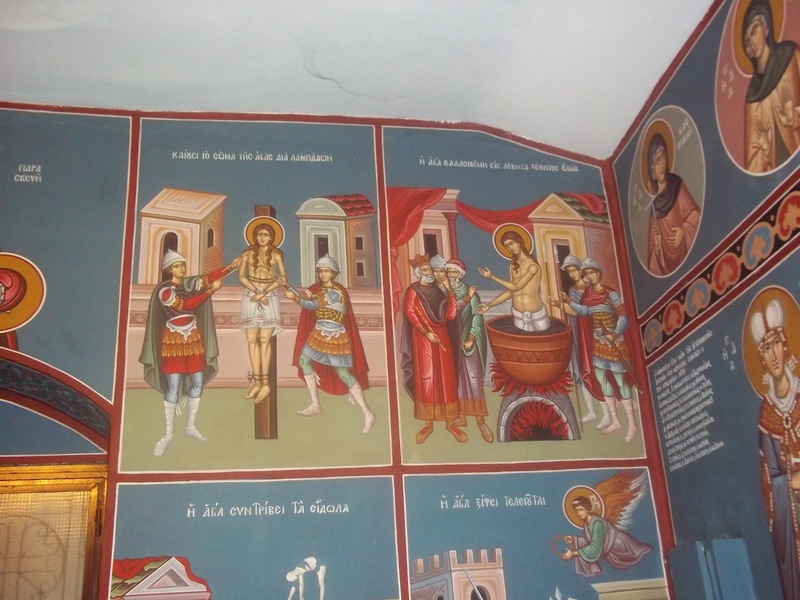 He was buried beside St Euthymius. The relics of St Euthymius remained at his monastery in Palestine, and the Russian pilgrim igumen Daniel saw them in the twelfth century. Rejoice, O barren wilderness! And be glad, sterile desert, that has never known the travail of birth! The man of desires has multiplied your sons; he has planted them in faith and piety. he has watered them with the Holy Spirit: they grow in self-denial and perfect virtue. Through his intercessions, O Christ God, preserve Your people in peace! That we may sing: Alleluia! Saint Basil was born in 1587 in the very old town of Yaroslavl. Yaroslavl was an important port on the Volga River. Basil's father Theodore was a poor merchant and his family often had very little food. Even when he was a very small boy, Saint Basil used to go to the church every time he could. He loved God's house and wanted to be there more than any place else. In those days, when a boy was twelve years old, he could become an apprentice. An apprentice is someone who works for a company without pay just to learn the business. The boss pays the boy's father a certain ammount and then gives the boy food and a place to live. Because Basil's family was very poor, he agreed to become an apprentice too. 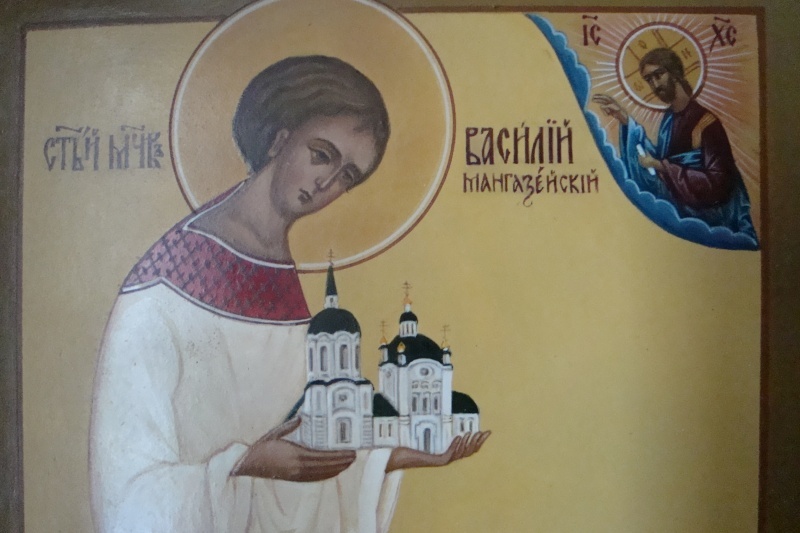 The saint became an apprentice for a merchant in the Siberian town of Mangazeya. Sibera was a very dangerous place, full of wild animals, war-like native tribes and lawless men. The journey to Mangazeya was long, difficult and full of danger. When Saint Basil arrived there safely, he hurried to the church to give thanks to God for protection on the road. Then he went to the merchant's office where he was given the job of clerk. Saint Basil was a very good and careful worker. Soon he was given a more responsible job in the company. Unfortunately, at that time Siberia was a frontier area, and there were almost no women there. Because of this, some men who had beastial passions used to commit homosexual acts with young men and boys. Saint Basil's boss was one of these perverse men. Soon after Saint Basil had arrived in Mangazeya, the boss tried to entice the youth into homosexual relations. He tried flattery, he offered Basil money and finally, he tried threats and punishments. Saint Basil only continued to fast and pray and ask God to help him remain pure. The boss began to hate Basil. He was angry that he would not submit to his evil lust, and he hated Basil's prayerful, religious life. He especially hated Basil for his meek and humble personality. But no matter how much he persecuted and mistreated the innocent lad, Saint Basil continued to faithfully and honestly perform all his duties and responsibilities. Finally, the persecutions and slanders reached a terrible point. During the Paschal Matins, theives robbed the merchandise house in which Basil worked. The boss, discovering the theft, went to the governor and reported the theft. But then a terrible deed occured: the merchant hated Basil so much and the evil in him was so strong that he formally accused the innocent of being the robber. 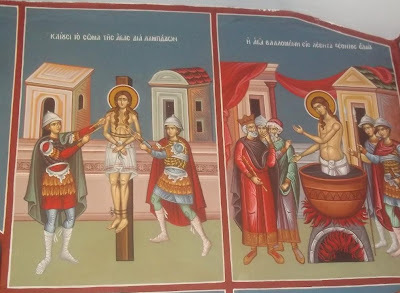 Thus, on the day of Christ's Bright Pascha, when the Holy Church calls all people to peace and love, this inocent, God-fearing boy was betrayed by a false witness, just as Christ had been betrayed by false witnesses. The governor did not even investigate the charges. He sent officers to arrest Saint Basil and drag him right out of the church. The governor and Basils boss began to torture the boy in order to force a confession out of him. In spite of all the fierce tortures, the blessed one would only reply meekly: "I am innocent." The pain of the torture became so unbearable that the youth fainted, but when he came to, he again quietly repeated, "I am innocent." The meek, humble, Christ-like endurance and peaceful reply of the young saint enraged the evil merchant even more. Finally, he flew into a demonic rage and struck the innocent virgin on the head with a heavy chain of keys. Saint Basil fell to the floor, sighed heavily and gave up his pure soul into the hands of the Lord, on the day of Christ's Radiant Pascha, 1600. In order to hide this foul crime, the Governor, Mr. Pushkin, and the passion-crazed merchant, placed the body of the holy martyr into a rough coffin and lowered it into a nearby marsh, weighed down with stones. 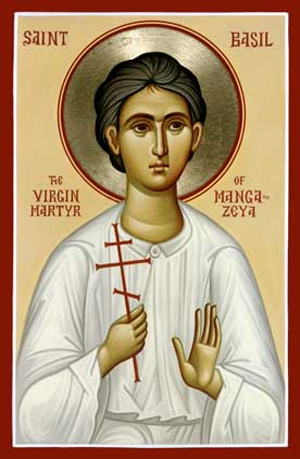 Rumors of the brutal murder circulated around the town of Mangazeya almost immediately after the incident, but God chose to conceal the sacred relics of His saint for fifty-two years. 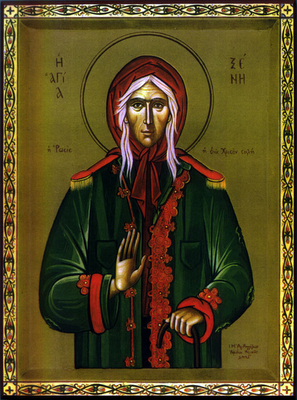 In 1652, during the tenure of the military governor Ignaty Stepanovich Korsakov, God willed to reveal the glory of His Virgin Martyr. In that year, many wonderous events began to occur in the area around Mangazeya. Many pious people had dreams in which a beardless youth appeared to them and many ill people were healed by this holy boy. A strange light was seen over the marsh and unseen voices were heard chanting nearby. Then, the coffin of the saint rose slowly to the top of the mud. A pious archer, Steven Shiryaev, noticed the coffin, but did nothing about it. Saint Basil appeared to him in a dream and told him to open the the coffin. 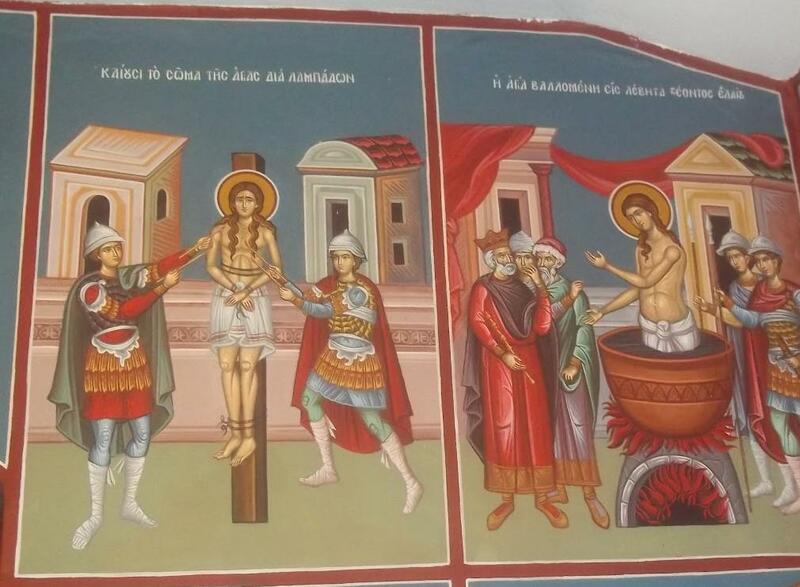 The whole story of Saint Basil's martyrdom became known. The coffin was brought out of the swamp and opened. 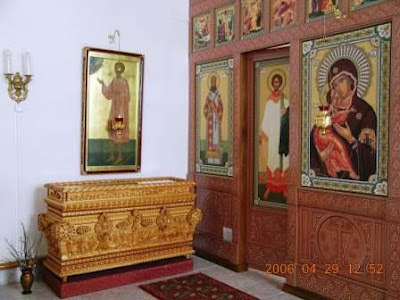 Inside they found the sacred relics of the saint, whole and incorrupt. 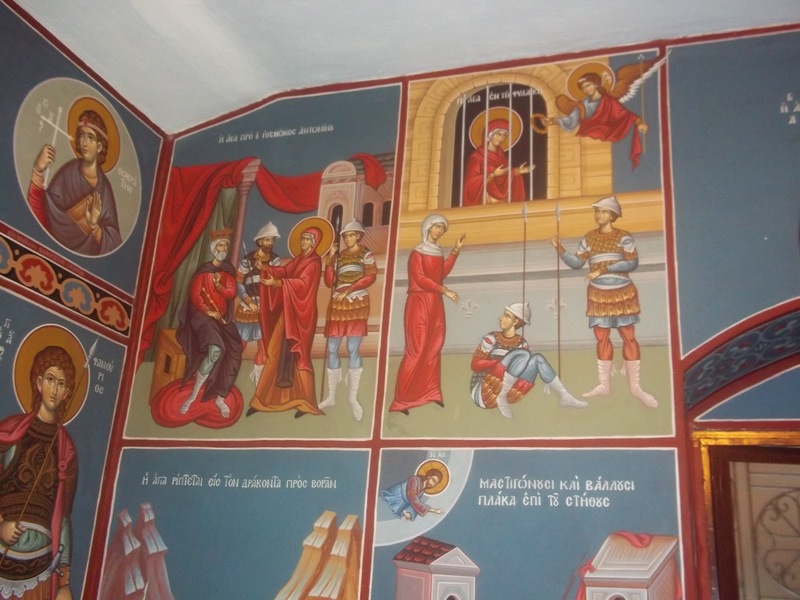 A chapel was built over the relics and many people received healing through the prayers of the young martyr. [A chapel was built over his grave, and in 1670 the relics were placed in the church of Holy Trinity Monastery near Turakhanov. A new stone church was built at Holy Trinity Monastery in 1787, and the relics were transferred there. Holy Virgin Martyr Basil of Mangazeya, pray to God for us! 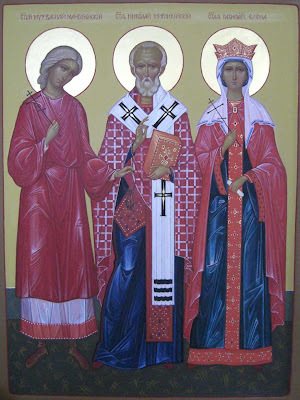 For another account with more miracles of the Saint (in Russian), see: http://www.ihtus.ru/092007/st05.shtml. 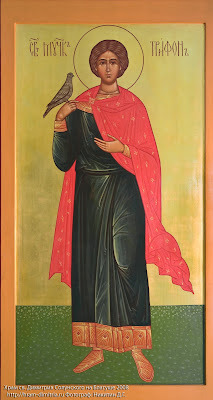 Thou O Basil didst witness unto death to the glory of virginity, and having been cast into the darkness of a swamp by thy cruel tormentors, thou didst ascend to the heights and shine forth with the glory of the Eternal Light, wherefore we cry to thee rejoicing, glory to Christ Who has glorified thee, glory to Him Who has made thee wondrous, glory to Him Who worketh healings for all through thee. 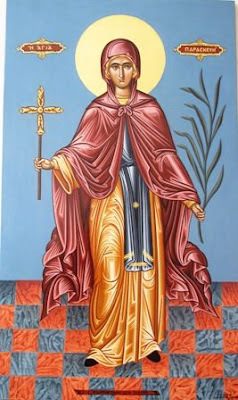 Chosen Martyr of Christ, patron of missionaries, protector of those who struggle for chastity, we see thee as a radiant lamp in the darkness of a wicked and perverse generation. And since thou hast been thrice-crowned by our Saviour, free us from passions, who cry to thee: Rejoice Holy Martyr Basil, radiant light of virginity. Бога́тство ви́дев чи́стыя души́ твоея́, Васи́лие, / укра́сти тща́шеся пра́ведных враг, / подусти́ господи́на твоего́, / и́же покра́денного ра́ди бога́тства своего́ преда́в тя судии́, / и от того́ непови́нне мно́гия претерпе́л еси́ му́ки, / непобеди́м пребы́в до сме́рти. / Тем, я́ко прие́мый вене́ц страда́ния от всех Влады́ки, / моли́ всем от напа́стей свобо́дным бы́ти, / чту́щим любо́вию святу́ю па́мять твою́. Я́ко пресве́тлое со́лнце, / возсия́л еси́ чудесы́ свои́ми в Сиби́рстей стране́, / в Мангазе́йских преде́лех, / но́вый му́чениче, непови́нный страда́льче, свя́те Васи́лие! / За чистоту́ душе́вную и теле́сную пострада́л еси́ от лю́таго врага́ / распале́нием и немилосе́рдием господи́на своего́ / и от нача́льствующаго бо ту градска́го непра́веднаго судии́, / и му́ки непови́нно претерпе́л еси́, / и кровь свою́ святу́ю пролия́л еси́, / жела́я ве́чнаго Ца́рствия Небе́снаго. / Сего́ ра́ди Христо́с Бог венча́ тя му́ченическими венцы́ на Небеси́, / и на земли́ просла́ви, / и Свои́м Бо́жиим про́мыслом повеле́ земли́ само́й от недр свои́х / гроб, и те́ло твое́, и сра́чицу, обагре́нную кро́вию твоею́, израсти́ нетле́нно. / И ны́не притека́ющим к тебе с ве́рою и везде́ призыва́ющим свято́е и́мя твое́ / поле́зная вся, и грехо́в оставле́ние, и телесе́м здра́вие подава́й, / чту́щим ве́рою святу́ю па́мять твою́, / и моли́ Христа́ Бо́́га спасти́ся душа́м на́шим. От гра́да Яросла́вля Бо́жиим смотре́нием / в страну́ Сиби́рскую прише́дшаго / и за целому́дрие от господи́на своего́ / в Мангазе́и пострада́вшаго, / блаже́нного Васи́лия почти́м, / его́же Христо́с Бог му́ченическим венце́м венча́ на Небеси́, / нетле́нием и чудесы́ просла́ви на земли́. / Ты же, честны́й страда́льче, / предста́тельством свои́м страну́ на́шу в ми́ре сохрани́ / и моли́ся о спасе́нии душ на́ших. На Бог Госпо́дь: тропа́рь свята́го, два́жды. Сла́ва, и ны́не, Богоро́дичен. Наста́ всечестны́й день пра́зднества / пренесе́ния моще́й твои́х, прехва́льне му́чениче Васи́лие, / от Тазу́ реки́ в Туруха́нск, в оби́тель Святы́я Тро́ицы. / Ра́дуются сердца́ ве́рных, красу́ется Це́рковь с вопию́щими: / его́же уби́сте и вмени́сте безче́стна, / сей ны́не на тве́рди Небе́сней изоби́лует сла́вою благода́ти, / в сы́нех Бо́жиих яви́ся. / Ди́вен еси́, Го́споди, не зри́ши лица́, но изволе́ния душе́вного. / Сла́ва венча́вшему Ти в ко́емждо ро́де му́ченики Твоя́, / сла́ва де́йствующему Ти си́лою во святы́х Твои́х. Ма́терь Тя Бо́жию и Де́ву мо́лим вси вои́стину, / в щедро́ты Твоя́ вопие́м, любо́вию прибега́юще к Твое́й бла́гости: / Тя бо и́мамы, гре́шнии, Засту́пницу / и Тебе́ стяжа́хом в напа́стех спасе́ние, еди́ну Пречи́стую. Не ктому́ держа́ва го́рдых челове́к / возмо́жет по убие́нии над непови́нными мучи́тельство име́ти, / но па́че са́ми уразуме́ют, коль подвиза́вшееся окая́нне уби́йством, / и́бо мня́щиися пораже́ннии коль све́тлии душе́ю горе́ со А́нгелы ны́не торжеству́ют, / на земли́ же священносло́вятся Це́рковию страда́ния их в ро́де и ро́де. / Го́споди, му́ченика Твоего́ моли́твами изле́й на нас ве́лию Твою́ ми́лость. Сло́во О́тчее, Христа́, Бо́га на́шего, / от Тебе́ воплоти́вшагося, позна́хом, Богоро́дице Де́во, / еди́на Чи́стая, еди́на Благослове́нная, / тем непреста́нно Тя воспева́ющее, велича́ем. Прехва́льне му́чениче Госпо́день Васи́лие, / целому́дрия был еси зерца́ло, друг Христо́вы кро́тости, / исто́чник ми́лости, презира́тель тле́ннаго бога́тства, / в нищете́ су́щим обогати́тель. / и́стины яви́ся почита́тель, доброде́тели и благоче́стия о́браз, / над страстьми́ влады́ка, духо́в лука́вых прогони́тель, / боле́зней и нечисто́т цели́тель гото́внейший, / раздая́тель от Бо́га прося́щим ми́лости. / Умири́ жи́тельство в днех на́ших, приснопа́мятне, мо́лимся. Стена́ непобеди́мая нам, христиа́ном, еси́, Богоро́дице Де́во, / к Тебе бо прибега́ющее, невреди́ми пребыва́ем / и, па́ки согреша́ющее, и́мамы Тя Моли́твенницу. / Тем, благодаря́щее, вопие́м Ти: / ра́дуйся, Благода́тная, Госпо́дь с Тобо́ю. Степе́нна, 1-й антифо́н 4-го гла́са. Проки́мен, глас 4: Возвесели́ться пра́ведник о Го́споде / и упова́ет на Него́. Стих: Услы́ши, Бо́же, глас мой, внегда́ моли́тимися к Тебе́. Вся́кое дыха́ние: Ева́нгелие от Луки́, зача́ло 63. Досто́йный ублаже́ния, му́чениче Васи́лие, / егда́, боле́знуя непови́нно, / в му́ках свои́х глаго́лал еси́: / лю́ты у́бо настоя́щия му́ки, / но ра́достна ве́чная жизнь. Страда́ние соверши́в свя́те, / погребе́ния же честна́го не сподо́бився, / в ти́нное ме́сто вве́ржен / и попира́емь был еси́ от мимоходя́щих, / но Бог просла́ви мо́щи твоя́ чуде́сным явле́нием, Васи́лие, / прославля́яйся во святы́х Свои́х, / дая́й страда́льцем вене́ц нетле́нный. Иже но́вый в му́ченицех непови́нный страда́льче, / свя́те Васи́лие, преревнова́л еси́ Ио́сифу Прекра́сному и Моисе́ю У́грину во искуше́ниих, / за чистоту́ душе́вную и теле́сную / му́ки непови́нно претерпе́л еси́. / Сих ра́ди просла́ви тя Бог,/ и святы́я твоя́ мо́щи, по явле́нию твоему́, / от Мангазе́и к Енисе́ю во оби́тель Святы́я Тро́ицы / ту су́щим настоя́телем принесо́шася / и подаю́т исцеле́ния с ве́рою приходя́щим / и везде́ призыва́ющим свято́е и́мя твое́. / Страстоте́рпче святы́й, / моли́ Христа́ Бо́га / о правосла́вном наро́де на́шем / и о всех во́ех на́ших, / побе́ду и одоле́ние нам на всех / непросвеще́нных иноязы́чных лю́дех дарова́ти, спобо́рствуя / ,и от междоусо́бныя бра́ни спасти́ся всем моли́. Просвети́ся Боже́ственною благода́тию, Боголю́бче, / целому́дрием и терпе́нием тече́ние свое́ му́ченически сконча́л еси́, / те́мже и по сме́рти яви́ тя све́тлость жития́ твоего́, / источа́еши бо чудесы́, / с ве́рою приходя́щим к честно́му гро́бу твоему́ и вопию́щим: / ра́дуйся, святы́й Васи́лие, / Мангазе́йский и всея́ Сиби́ри чудотво́рче. Святы́й му́чениче Христо́в Васи́лие, ра́дости святы́х единовсе́льниче, на́ших скорбе́й и печа́лей премени́телю и вся́кого зла де́монскаго губи́телю, припа́дая, молю́ ти ся: прииди́ в заступле́ние мое́, я́ко да очи́стится ум мой от дея́ния грехо́внаго, поне́же лиша́юся за сие́ благода́ти Бо́жия; не име́ю тве́рда основа́ния к покая́нию, даждь ми умиле́ние душе́вное и сле́зы грехоомыва́тельныя, воздежи́ ру́це твоя́ святы́я за убо́гую мою́ ду́шу ко Го́споду Иису́су Христу́, не оста́ви мене́, гре́шнаго, ра́ди моего́ невоздержа́ния, укрепи́ мя бе́дсствующаго душе́вными по́мыслы и вне́шними обурева́нии, и́миже сам себе́ вина́ быва́ю, или́ от ненави́дящих мя впра́вду, но вся по грехо́м мои́м пра́ведно бы́ти испове́даю. Бу́ди ми, малоду́шному, покрови́тель и побо́рник благ и ми́лостив, присеща́й мя, гре́шнаго, в ско́рбех и печа́лех и сохраня́й от вся́каго смуще́ния проти́внаго, да не когда́ прогне́ваю Бо́га моего́ и тебе́, смоле́бника моего́ блага́го, но утверди́ мя моли́твами твои́ми в стра́се Бо́жии и досто́йна покажи́ своея́ всегда́ ми́лости. Ами́нь.